The emerging field of neuroanalytics is helping us to better understand our emotional reactions. A team of researchers at Ryerson University’s SMART Lab is putting these new techniques to work, gaining insights into what we feel when we listen to music. Now, they’re collaborating with the developers at WaveDNA, creating the next generation of digital music software. And ORION is helping to make it happen. Have you ever noticed how much music can change your mood? Maybe you’ve felt sad, or lonely, but when you hear a certain song your spirits rise. It seems like magic. But Professor Frank Russo is unlocking the mystery behind those feelings. He’s the founder of Ryerson University’s SMART (Science of Music, Auditory Research and Technology) Lab; it’s here that he and his research team carry out his work in the field of music cognition and science. 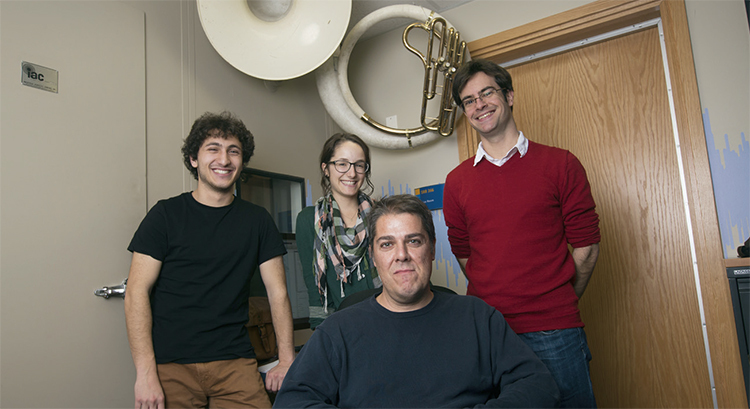 Professor Russo studies the body’s physiological reaction to music. Heart rate, perspiration levels, respiratory frequency—all of this information, and more, is recorded using SMART Lab’s sophisticated technology. Hundreds of people are tested. And out of the buzzing swarm of data generated by this research, something starts to emerge: a codified understanding of how music affects us. It’s thanks to the cloud-based space accessed through the ORION network that Russo and his team can share the vital files and data they work with. ORION’s fast and reliable service facilitates collaboration—between the members of Russo’s team at Ryerson, with their colleagues at other institutions, and with private businesses—on the cutting edge of new technology. Glen Kappel is the Research Lead at music software specialists WaveDNA. Enter Glen Kappel, Research Lead at music software specialists WaveDNA. His company has been collaborating with SMART Lab for years, using Russo’s groundbreaking research in their quest to build more intuitive music software. “One of the things we’re interested in,” Kappel explains, “is lending performance expression. For example, there may be a great bass player you like, with a distinctive style, certain rhythmic tics or a ‘feeling’ to the way they play.” Using the data provided by SMART Lab, WaveDNA is working to capture those expressive properties in their software, giving musicians a powerful new way to create emotionally affecting music. Among many innovations, Kappel’s team is using Russo’s research to create “virtual ears”—a digital audience to whom you can play your work in order to gauge the emotional response—and to develop “suggestion engines” for music production. The collaboration is not only furthering SMART Lab’s international reputation as an innovation hub for research at the intersection of music, mind and technology, but it is also allowing Russo’s team to focus their research questions in new, applied directions, giving their work the chance to have a greater impact on the world outside the lab. And that’s only the beginning. As the dataset at SMART Lab grows ever larger, ORION’s powerful data-sharing services will allow the team at Ryerson to continue to collaborate with a variety of partners. It’s an exciting time that already promises a groundbreaking new product for WaveDNA, a series of powerful new composition tools for musicians, and, ultimately, a more enjoyable listening experience for music fans everywhere—all while bolstering Ontario’s innovation economy.